We’d like to thank our guests for allowing us to use their kind words on our website. Here is just a sample of the wonderful reviews we have received about our Bed and Breakfast and Walk With Me battlefield experience. We always want to know what you think so please do give us any feedback so we can continue to offer a high standard of accommodation at No.fifty6. You can contact us directly or leave comments on TripAdvisor. We want to thank you for your outstanding hospitality at Number 56. All the family found it very relaxing, not like any hotel or B & B I have ever stayed in. The food was amazing and your hospitality outstanding. Both of you are so knowledgeable about the Somme battlefield and David took so much time with the children in explaining various aspects of the equipment used in the war. I think James, our grandson, summed up what we all thought about the trip when we were saying good bye to Steve “it was the best holiday he ever had”. Despite the sombre nature of the trip we also had lots of fun as well. Linda and Gary Richardson & family." "Our 5 days with David and Julie was quite simply, exceptional. We were guided by them so sensitively to 'walk in the footsteps' of our men across the beautiful Somme landscape and to reflect on the tragedy and lessons of that time. It was a profound experience for us all, for which we are very grateful. Thank you." "You two are amazing. When we visited in June 2017, I never thought I would be pulling German barbed wire out of a ditch near your front yard or watching Sarah pull out and hold up a clip of 100 year old ammo. Unbelievable. When I was in Saltzburg Museum following our extraordinary experience with you two I took a few pics on my phone that may help to explain what the long hunk of metal is that came out of the trench by your front gate. I cant begin to tell you the debt that I feel our family owes you two. You are definitely in a different league from anything I have ever experienced before. A massive thanks for having us all this week. Food, accommodation, walk with me and even the chickens was great and it turned out to be the best possible booking for our party. Nothing was too much and we felt spoiled and looked after in a way that rarely happens now. Well I am now back in Australia after a fabulous 3 months in the UK and I wanted to thank you both for an amazing weekend at Number 56. It felt like a home, not just a B&B. You couldn’t have made us more welcome and we left feeling we had made new friends. We loved the accommodation – again it felt like home. And the little extras, such as the plug adapter and weather report, were most welcome. Breakfast was yummy and the packed lunch, too! But the absolute highlight was the unique and wonderful tour of the Somme battlefields. The initial ‘briefing’ before we left, which helped to set the scene and the actual visit, which was just amazing and brilliantly researched. We can appreciate how much hard work goes into these tours and it is obvious that you both have a great love for your work and for the Somme. Thank you , David, for bringing the tour to ‘life’ – you treated my two grandfathers with warmth and respect. Sadly we never met either of them but you gave us a real feeling of connection with them both. We had no idea what happened to William Fry. So It was very touching to see the actual field at Ginchy, where he had gone into the attack and where he most probably fell. It was a sobering and very touching experience. Likewise to actually visit High Wood, where Harry Ambrose was seriously injured. How ironic that it all happened on the same day and only a few miles apart. Although the weather was not ideal in one way, we actually liked the idea that the weather conditions were very similar to those on the actual day, the fog made it very atmospheric." "David & Julie must set the ultimate standard for the perfect hosts. From the timely response to our initial enquiry to the day of our arrival at Amiens Station to find our hire car wasn't there and they helped us sort it out, to the personalised and caring service, homely atmosphere and cooking, as well as their knowledge and appreciation of the history of the area and general knowledge, everything they did was exemplary." "I want to thank you both so much for your wonderful hospitality during our stay with you last weekend. You were such amazing hosts throughout our stay in making Hilary and I feel so at home and looked after. We both enjoyed the offers of cups of tea/juice and the lovely meal you prepared for us on our last night and sharing that time with you. It is wonderful that you both have such a deep resonance with the Somme." Appreciate - as always - the extra bit you go to to make it happen - hope that sounds right!!! Very best wishes - Ash"
"Just to say a really big Thank You for making our trip to France so unforgettable. Our accommodation was very comfortable and stylish with everything we needed including lovely views across to the church with the lovely soft bells ringing in the morning. Meals were sumptuous and generous and the interest and knowledge you showed for our quest was unbelievable. Once again our heartfelt thanks for a wonderful time - even providing two lovely guests in Sally and Chris - who had such a great story to tell and were such good company. Should anyone I know ever need accommodation in your delightful and interesting area you are top of the list, truly home from home. Wishing you both all the very best, Cherry"
"Many thanks for the way you looked after Leisa and I last weekend. Your accommodation and meals were excellent, your conversation enlightening and the information of the memorials and history in the area was pivotal in ensuring that we properly recognised the significance of the sacrifice made by Thomas Patrick Shannon. I will thoroughly recommend to our families and friends who travel there over the coming years to try and stay at Number 56. To all Australians who have an interest in the Somme and its history, I would suggest you contact David and Julie to use Number 56 as a base in the area. Regards to you both, Tim and Leisa Corcoran"
Arrived back safely in London on Wednesday and back home yesterday. I just wanted to say thanks so much for helping make our stay with you such an enjoyable one and it was a bonus to find that Sally and Chris shared our table. We all got on so well, "jelled" I think is the word. Wonderful food at every turn. Good luck to you both. I know you will be a success with your business." "Thank you so much for your hospitality. Never has a random search on google worked out so well. Your B&B is lovely. Your ability to get a group of many different ages engaged in what happened on the Somme – that’s special. It’s also important." "Just wanted to thank you again for a fantastic experience at your B&B and the accompanying tour. David absolutely made the Somme battlefield come to life for us and we really learned a lot. And the great food, drink and conversation in the evenings were equally enjoyable." "We would like to thank you for your fantastic hospitality and your ideas of where to visit and in depth knowledge of the area. We all thoroughly enjoyed our meals and it was nice to all eat together in the evening; we particularly enjoyed the witty banter and we can all say we have made friends. It was a memorable trip and we would love to return." "Many thanks for making my trip to the Somme so enjoyable. Your hospitality and charming farmhouse are second to none. Your knowledge of the area and the events of 100 years ago added immensely to my exploration of the area. I have been meaning to see the Somme for many years, so glad I did, what a great five days." "Carole and I would like to thank you both for such a positive and informative experience, and especially for your wonderful hospitality. We were really impressed by your patience and clarity in answering our many questions. We now feel that we can give our family a sense of the sacrifice made by our grandfather's generation." "I am writing, on behalf of us all, to thank you so much for the welcome and hospitality we received when we stayed with you. From the moment we sat under your gazebo with a glass in hand to the time we left we just felt as though we were in the company of friends. The tour with David was extremely interesting, particularly going to places off the beaten track that do not appear in the guidebooks, and his knowledge and commitment were very apparent." "A super homely b&b. My friend and I were made to feel extremely welcome for our two night stay. Dave and Julie treat you like part of the family. Their knowledge and advice on the area is second to none. A big thank you and I hope to visit again." "A very big thank you to you both. Such a great welcome and place to rest and chill out. Julie and David made our short stay a memory that will stay a long time. David went above the call of duty to help me track down my great uncle's movements in the Great War. Julie and Dave we will be back . All the best to you both . A personal touch right down to the hugs and good byes. Thank you so much. James and Paul from Derby, England, March 2014"
"Just a line to say thank you making our stay so warm and pleasant, it was like home from home. I must also say the day on the battlefield was fantastic, and for that a big thank you Dave. It was very emotional at times, especially Sunken Lane and Thiepval where my dad may have been. I've no doubt our paths will cross once more, as god willing, I'll be visiting again." "A line to to say thank you for such a lovely three days at Number 56. You are such splendid hosts and we thoroughly enjoyed our stay with you. Also a thank you to David for an interesting guided tour and all the other excellent advice. Everything was superb and to a very high standard. We wish you continued success and many visitors in the future. We loved the area and No 56 in particular. "We had such a wonderful time. I positively loved every minute of our trip and you're quite right, it was far too short, especially our stay with you both. I was blown away by the hospitality of our French hosts and then we arrived at your wonderful house and were immediately welcomed into your home. Upon my return home, I told my wife about the welcome drink, the wonderful tour from David and the night-cap glass of wine before bed. I so hope your business goes from strength to strength, as you thoroughly deserve it. It was like staying with long-term friends, thank you so much. We very much hope to return and you will be our first port of call. All the best to you both." "Dear both, just a belated thanks for your superb hospitality last week; we had a fantastic time and are now busy recommending you to anyone coming close to France. As I explain to them, and using Bruce Bairnsfather's words, "Well, if you know of a better B&B, go to it!" "Everything about this B & B is exactly right. For anyone visiting the Somme battlefields the position is wonderfully situated on the German front line of the opening of the battle. The accommodation is clean and very comfortable. The hosts have a large library on a variety of subjects and guests are more than welcome to browse and read whatever takes their fancy. However the main attraction of this B & B are the hosts themselves. From the moment I arrived I was treated as a friend rather than a client. I hope to return on my next trip to the Somme." "Just a quick note to thank you both for your hospitality last week. We felt very welcome and at home at number 56 and we all thought it was an ideal base for our battlefield visits. Your great breakfasts set us up for the day and you were very accommodating with our picnics on your patio. All in all we had a great time and will be recommending Number 56 to friends, and we hope to return to use your accommodation again." "Thank you for all the care you took to make our visit to the Western Front so memorable & successful. Without your attention to detail we would not have felt so relaxed and without all your information & advice would not have achieved so much in our searches for family wartime service." "As B&B owners you have clearly found your absolute forte in life – you are by far the most helpful and welcoming people I have ever dealt with and your customer service has been outstanding." "From the moment we arrived you made us so welcome and it really was a home from home. Your kindness, knowledge of the Somme and generosity were way beyond the call of duty. To anyone going to the Somme I can assure you that you will not find anywhere better. No. 56 is heaven in a place that was once hell. Once again thank you so much for everything. We will be back. Jim, Mark and Paul. PS. Something in the air at 56 has caused my trouser waistband to shrink!!! or is it those fab breakfasts ? Who knows?" "I had a very enjoyable stay at Number 56 and can heartily recommend it. Julie and David are superb hosts who go out of their way to make your stay as comfortable as possible. By the end of my time there they were more like friends than proprietors. This is the place to stay!" - Stephen Miles, Swansea, UK. March 2013. "As an Australian travelling to the North of France for the first time, I didn’t know what to expect from the Somme. Gallipoli has forever been part of Australian folklore, but what faced me on the Somme made it look like a children’s playground. Too many Australians sacrificed their lives in this area alone – David and Julie’s knowledge of where Australians fought and died, gave it such a personal touch, that I grew up in a single afternoon. I will forever be grateful for what I have experienced and think that every young Australian should do the same, even if it’s just once in their lifetime. I am proud to have walked alive amongst those Aussie heroes." "No. 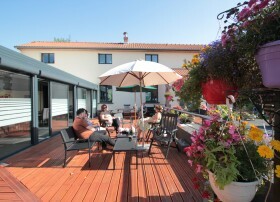 fifty6 - What a fabulous B & B in the heart of the Somme. Having never been to this area before we were totally blown away by the hospitality we received at this magnificent B & B. The rooms are spacious, welcoming and comfortable. The breakfast is superb, we were made to feel very welcome and nothing was too much trouble for Julie and David, the owners. Even if you are not interested in history, you cannot fail to be moved by your emotions at some of the places you can visit in the area. Thiepval is a 'must' - thousands of names on one memorial - it took my breath away. Cannot recommend this place enough - we will, without a doubt, be going back." "Our first ever trip to the Somme and we will definitely return, not just for the emotional and interesting area but to once again enjoy the comfort and hospitality of this lovely b&b which is home from home. Julie and David the owners,made us so welcome and gave us some extremely useful information about the area and key places to visit. We look forward to our next visit later in the year." with us and setting us up each day with a lovely breakfast Julie. We will see you soon as you have watered our appetite for more knowledge of the area. Thank you." "An amazing visit to No.fifty6. David and Julie have given me a greater understanding of The Great War. I now go home with many things to think about and will come back with many more questions. Thank you David and Julie." "First visit to No.fifty6 and we are already planning our next trip! A wonderful weekend and extremely thought provoking. Everyone should "Walk With Me". Slept so well, very cosy. This is the perfect place to stay. Thank you to 2 wonderful hosts." March, always capricious has been a month of two halves weather-wise. The first half was wet, windy and chilly. We had a week of windstorms with gusts up to 100km/h which saw tree damage and electricity lines down in many parts of the Somme. Luckily, apart from a few wayward branches on our trees and a few roof slates, (now repaired) we had no lasting damage. The second half of March has been warm and the blue skies are back. A beautiful weekend of Spring weather saw us put the clocks forward one hour on Saturday night. Spring really has arrived. It has been a busy month here, guests finding their way to our door and even a few outings for ourselves to discover new places.